When searching for dramatic plants to punctuate the garden our first thoughts usually turn to foliage: to bamboos and phormiums, bananas and tree ferns. Few flowers are sufficiently imposing to make a bold statement by themselves. The tall single flower spikes of Eremurus, though, are as impressive and exotic-looking as any foliage plant. Known as Foxtail Lilies their other common name of Desert Candles more accurately describes the flower: a spear of tiny buds on a thick stem, sometimes nine feet tall, that slowly open from bottom to top until the whole upper three feet of the plant are alight. After the flowers have faded the stems are covered with seed pods the size of Mirabelle plums. Eremurus grow from the oddest-looking bulb you will come across: a central fat bud surrounded by long fleshy roots that looks like a giant starfish. To have the best chance of success in growing eremurus it is important to start off with good, healthy bulbs. Avoid ones with thin, broken or shrivelled roots and make sure that the central crown is firm. The bulb needs to be planted in a wide shallow hole, so that the roots can be laid out flat, with the top of the crown just below the level of the soil. In the wild Eremerus grows in deserts and mountains in the Middle East, the steppes of central Asia and in the foothills of the Himalayas where the winters are very cold but very dry. Mimicking these conditions during the mild and wet British winters can be difficult. On heavy, clay soils it is essential to lay the bulb on an inch-deep layer of grit to make sure that the water can drain away. If it is sitting in wet soil during the winter the bulb will rot. My soil is very free-draining but I still put down a layer of grit as an added precaution against very wet winters. 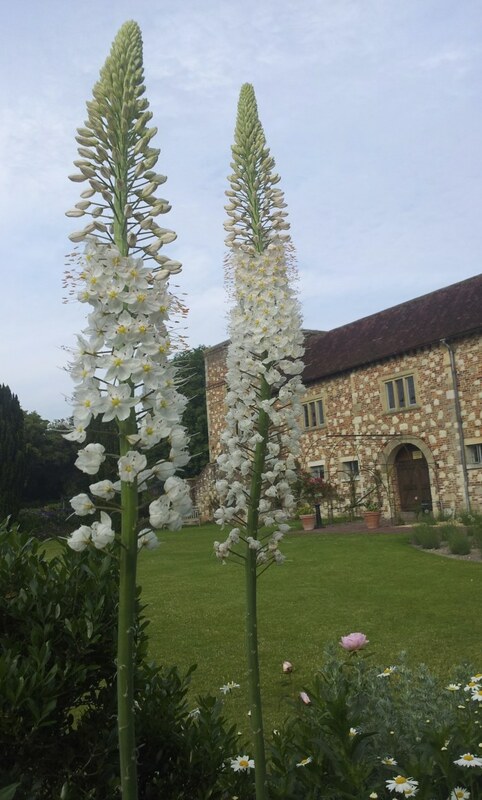 Plant it in a part of the garden that is in full sun and where the Eremurus will not be muscled-out by other plants. Choose your planting area carefully because Eremurus don’t like being moved and will often sulk and refuse to flower the first year after moving. Some nursery catalogues advise covering the crown of the plant with a mulch of dry bark or bracken to protect the early growth from late frosts. I’ve never done this because mulches can provide a snug home for slugs and snails to lie in wait for the new shoots to appear. The extra warmth that the mulch creates can also encourage early, sappy growth that is susceptible to even the slightest frost. If you are trying to create an instant clump of flowers, you can plant bulbs close together with the roots overlapping, otherwise plant them two to three feet apart. Five years ago I planted a dozen E. himalaicus about four feet apart. At the time it seemed mean, but they have now grown into a dense wall of white spires. Several years ago I remember seeing a television war-correspondent reporting from some strife-ravaged area of Afghanistan. Dotted through the bleak landscape behind him were dozens of magnificent Eremurus flowers. I don’t know whether the reporter was wanting to make some point about Nature Triumphant or finding Beauty even in Desolation, but you could see the dramatic effect that the plant has in the wild. Transplanted into the comfort of a British garden they can seem even more powerful. E. robustus will grow to 9 feet in hot summers and has a dense cylinder of pale pink flowers that last throughout July and August. At 7 feet tall E. himalaicus is slightly shorter, but just as impressive. The flowers are pure white. E. stenophyllus subsp. stenophyllus is the easiest of the genus to find in nurseries and garden centres. The flowers are yellow and fade to burnt-orange with age and grow to about four feet tall. At the end of the 19th century a group a hybrids, known as the Shelford hybrids, were raised with flowers that were mainly bronze and orange. These have been raised from seed and the colours of plants now sold is very variable. More reliable are the Ruiter hybrids, bred from E. x isabellinus during the 1960’s and 1970’s. ‘Cleopatra’ has orange-red flowers, ‘Obelisk’ white flowers tinged with green and ‘Pinokkio’ has yellow buds that open to deep orange flowers. All are short, about 3 feet tall, and can be grown in wide pots.